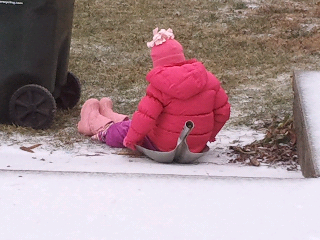 This is how farm kids have fun on an icy Saturday. Andrea--Congrats to you and Mark on a wonderful family. We have two boys and a girl, which you may have seen here on the blog. Tell Mark I said hello. And, also, please tell him that my husband's family had grand champion steer back in 1990. I am still ashamed of the steers my brother and I had back then. But I think I've moved up in the livestock world. HA! Let us know if your girls ever decide they want to show hogs. Or if you get to the Ohio State Fair during the first week--we're always there!